Boosts certain moves’ power in a sandstorm. X Wird es von einem natürlichen Feind angegriffen, flieht es, indem es ein lila Sekret über die Haut ausstößt. X Attaqué par un prédateur, il fuit en libérant un liquide mauve. X Si se ve amenazado por sus enemigos naturales, segrega un líquido morado y huye rápidamente. X 천적에게 습격당했을 때는 보라색 액체를 몸에서 내어 도망간다. Y In Urzeiten muss es einen großen Schutzpanzer besessen haben. Es lebt in kleinen Wasserstellen. Y Jadis, il semble qu’il portait une grande carapace pour se protéger. Il hante les eaux peu profondes. Y Al parecer, hace mucho tiempo tenía una gran concha protectora. Vive en aguas poco profundas. Y Pare che in passato il suo corpo fosse protetto da un enorme carapace. Vive in bacini poco profondi. Y 아주 옛날에는 튼튼한 껍질로 몸을 보호하고 있었던 듯하다. 바다의 얕은 곳에서 서식한다. Omega Ruby It apparently had a huge shell for protection in ancient times. It lives in shallow tidal pools. Omega Ruby In Urzeiten muss es einen großen Schutzpanzer besessen haben. Es lebt in kleinen Wasserstellen. 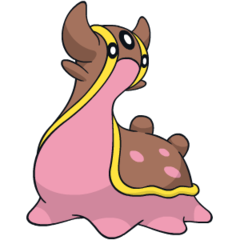 Omega Ruby Jadis, il semble qu’il portait une grande carapace pour se protéger. Il hante les eaux peu profondes. Omega Ruby Al parecer, hace mucho tiempo tenía una gran concha protectora. Vive en aguas poco profundas. Omega Ruby Pare che in passato il suo corpo fosse protetto da un enorme carapace. Vive in bacini poco profondi. Omega Ruby 아주 옛날에는 튼튼한 껍질로 몸을 보호하고 있었던 듯하다. 바다의 얕은 곳에서 서식한다. Alpha Sapphire When its natural enemy attacks, it oozes purple fluid and escapes. Alpha Sapphire Wird es von einem natürlichen Feind angegriffen, flieht es, indem es ein lila Sekret über die Haut ausstößt. Alpha Sapphire Attaqué par un prédateur, il fuit en libérant un liquide mauve. Alpha Sapphire Si se ve amenazado por sus enemigos naturales, segrega un líquido morado y huye rápidamente. Alpha Sapphire 천적에게 습격당했을 때는 보라색 액체를 몸에서 내어 도망간다. Sun It has strong regenerative capabilities. Even if parts of it are bitten off by fish Pokémon, it will return to normal within a few hours. Moon Plankton, invisible to the naked eye, is its main food source. It comes onto the land periodically, but the reason for this is not known. Diamond It has a pliable body without any bones. If any part of its body is torn off, it grows right back. Pearl It apparently had a huge shell for protection in ancient times. It lives in shallow tidal pools. Platinum Long ago, its entire back was shielded with a sturdy shell. There are traces of it left in its cells. HeartGold When its natural enemy attacks, it oozes purple fluid and escapes. SoulSilver When its natural enemy attacks, it oozes purple fluid and escapes. Black Long ago, its entire back was shielded with a sturdy shell. There are traces of it left in its cells. White Long ago, its entire back was shielded with a sturdy shell. There are traces of it left in its cells. Black 2 Long ago, its entire back was shielded with a sturdy shell. There are traces of it left in its cells. White 2 Long ago, its entire back was shielded with a sturdy shell. There are traces of it left in its cells.